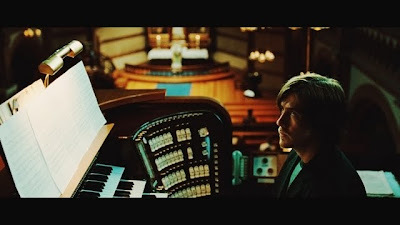 Never wavering in his stance as an “innocent man” in the death of a child, once Jan completes his prison sentence, he accepts a position as a church organist. Changing his name from Jan to Thomas Hansen, he settles into the position that conveniently comes with an apartment and transportation in the form of a bicycle, unsure whether or not evil is an act of the God he believes in or the result of himself. Yet, we quickly discover that Jan/Thomas isn't in the business of asking too many questions of himself as – despite earning the trust and affection of the church's Pastor Anna and her child Jens-- the only way we're able to piece together exactly what happened and question whether or not the death was murder or accidental is through a series of brief flashbacks. Taking us back to Jan and his friend's startling kidnap of a baby in its stroller, snatched away quickly from its mother who sets foot inside a shop and leaves it unattended in a sleepy Norwegian village, the haunting images begin revealing the bigger picture behind the devastating death. However, as a character, it's hard to feel overly invested in Jan, whether or not what he was involved in was murder or misfortune. To this end, the film isn't very effective until finally Hawaii Oslo director Erik Poppe's Troubled Water switches point-of-view to let us see everything via the perspective of the baby's mother Agnes from the day of the death up through the present when she wanders into the church and soon recognizes Jan.
What would you do if you saw the man you believed murdered your baby working in a holy place? For Agnes, whose life on one level essentially stopped the day the child died, the situation becomes a moral and ethical nightmare of epic proportions as she has trouble navigating the past and the present life she shares with her husband and adopted daughters. Easily the strongest role in the film in a visually hypnotically intoxicating effort with cinematography so awe-inspiring that it seems to reflect every single light source in each scene, Agnes is a much more fascinating character than Anna, who in addition to being insulting to women seems like nothing about her personality goes with her profession. 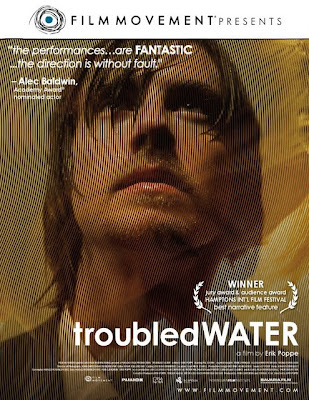 A richly textured but imperfect film, Troubled Water may be ideal for professors to use as an ethics course assignment for students. Still, overall and despite the powerful performances and technical excellence from the director of photography, the flaws of the overflowing Water outweigh the strengths in terms of cinematic justice.